The Christian Elder Memorial 900 is dedicated to the memory of Christian Elder, who died in 2007 at the age of 38. 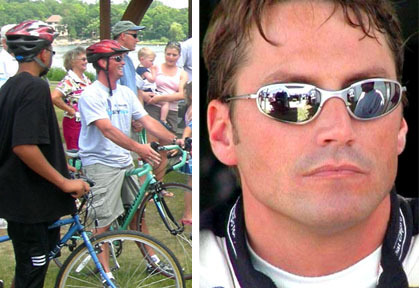 Christian was a successful professional NASCAR driver until 2002, when an accident ended his career. He later joined on as a project manager for Elder-Jones, the family owned construction business. Whether it was his career as a professional race car driver or later his career working as a construction project manager for Elder-Jones, he always took pride in his work and achieved success. His expectations of himself were high and he worked very hard to meet those expectations. His work was always done at 100%, and never less. His work ethic always led to gaining the respect of his peers and clients. Christian had an energetic and adventurous soul. He was charismatic and his smile and laugh would brighten any room. He had a passion for life that would take him to explore many corners of the Earth, drive at great speeds, dive to great depths, and have fun every day like it was his last day. Those that knew him well also know that he was an extremely loyal friend. He took great joy in spending time with his friends and family and was always willing to lend them a helping hand. As a friend, as a brother, and as a son, he was loved by many. Christian was there to greet his dad and the other 900 mile participants as they finished the first two 900-mile charity bike rides. He was planning to join the team for the 2008 event. All who ride and participate in the Christian Elder Memorial 900 Charity Ride, do so in loving memory of Christian.